Steve didn’t specify an image so I’m using the first image that comes to mind. Thanks to Robin Ashford this wonderful CC-licensed photo by Matt Wiebe has been in my mind all week. Robin used this as the closing image in her excellent presentation: Guiding learners towards digital fluency. Such a powerful photo (thank you, Matt!). Firstly, there’s the idea of a frame or snapshot in time. What is happening just before or after this moment? What is happening just outside of the frame? Is this little girl running from her parents to her grandmother? running to keep up with a big brother or sister? perhaps running for the sheer joy of hearing the sound of her own footsteps in the echo-y train station? From this one image we don’t know. We can only imagine. As an educator this feels familiar. When learners are silent or absent we often don’t know why. Silence or lurking can be so many things: thoughtful engagement, confusion, a crisis of confidence, a lack of time, a strategic reallocation of time elsewhere, or… who knows? What’s outside of the frame? It’s easy to make assumptions, especially when we operate (often subconsciously) with particular definitions of “engagement” or “success”, themselves propped up by the requirements of our various programmes and institutions. In another #blimage blog post today, Space to make ideas your own, the always-thoughtful Jeff Merrell writes about how he’s learning to allow more space and time for his students for emergent learning — i.e. learning to trust learners. Jeff’s post also led me back to my friend Helen Crump‘s #blimage post about learning as “an identity job”, once again highlighting the need for trusting learners, and building relationships with learners. Another aspect of this photo is that I see myself here — apparently alone, but not alone. This past six weeks or so has been unusual in many ways for me. 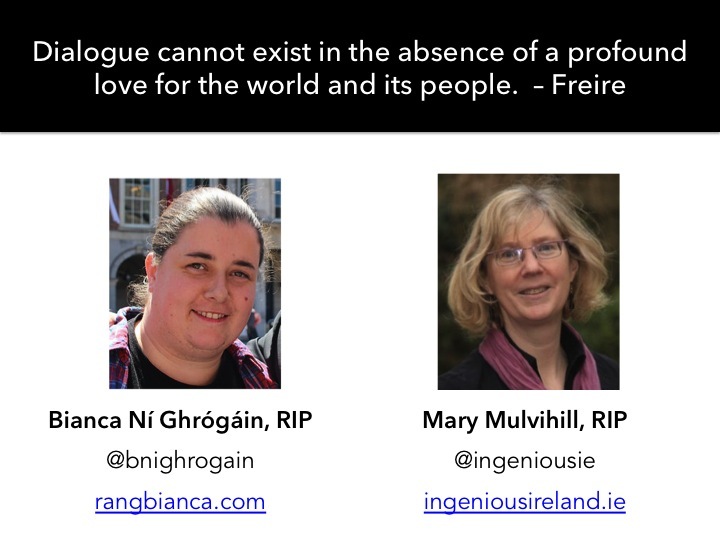 I lost two good friends at the start of June, a terribly sad time. I was less active online but connected with friends in many other spaces and places — funerals, kitchens, back gardens, and a few longs walks along Heaney’s Flaggy Shore. So while one frame of this summer might show me somewhat quiet on Twitter, and definitely quiet here on the blog, other frames would show something different — close connections, deep reflection, and rich learning. Alone and together, moving and learning. A beautiful post Catherine, thank you.